These bright rims and flowing shapes look ghostly on a cosmic scale. 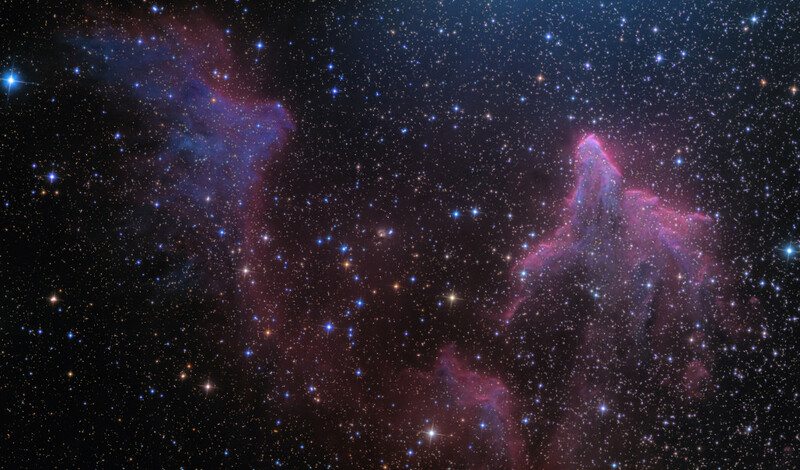 A telescopic view toward the constellation Cassiopeia, the colorful (zoomable) skyscape features the swept-back, comet-shaped clouds IC 59 (left) and IC 63. About 600 light-years distant, the clouds aren't actually ghosts, but they are slowly disappearing under the influence of energetic radiation from hot,luminous star gamma Cas. Gamma Cas is physically located only 3 to 4 light-years from the nebulae, just off the top right edge of the frame. Slightly closer to gamma Cas, IC 63 is dominated by red H-alpha light emitted as hydrogen atoms ionized by the star's ultraviolet radiation recombine with electrons. Farther from the star, IC 59 shows proportionally less H-alpha emission but more of the characteristic blue tint of dust reflected star light. The field of view spans about 1 degree or 10 light-years at the estimated distance of gamma Cas and friends.